You're About to be Redirected to the New Home of Ground Control to Major Mom: 3 Times in 26 Months! 3 Times in 26 Months! On what remains of my G.I. I'm writing this corny little song from the surgery waiting room at University of Nebraska Medical Center near downtown Omaha. Dave is in the middle of a basic hernia repair. This is a pretty common procedure, and for the most part I'm feeling pretty confident that everything's going to be all right. It's worth discussing that there's something about Nebraska that's been driving Dave into the operating room every 13 months. First, there was his emergency appendectomy about 3 weeks after we moved here in August 2008. Then, in September 2009, Dave's gall bladder removal. Which apparently I didn't write much about, I was in a blogging drought in late 2009. Don't know why. I just looked at my blog posts from August/September 2009 and there wasn't much at all. Anyway, here we are, back again, for Dave's 3rd surgery in 26 months. All of these procedures are pretty routine, and Dave recovers pretty nicely. You can't even see his laproscopy scars from the first two procedures anymore. This one is an open procedure, so he'll have a no-kidding incision on his lower abdomen, but that's okay. Dave's health has been an absolute nightmare since we moved to Nebraska. We aren't sure if it's the air here, that our house is haunted, or the stresses of Dave's job. Or just that his gastro-intestinal system was due to take a nosedive right about when we moved here. We don't know for sure. It's certainly frustrating, especially for a guy who didn't really have any big medical issues right through age 30! The occasional twisted ankle, bout of the flu, etc. We're glad he's getting this taken care of quickly, but it still takes away from the normalcy of our lives. But our life is anything but normal, right? Dave's convalescent leave will take him right up to his trip to Florida to pick out a new house, then my Reserve 2 week tour in early November, and then we go right into the movers coming to pack up our house for our move! 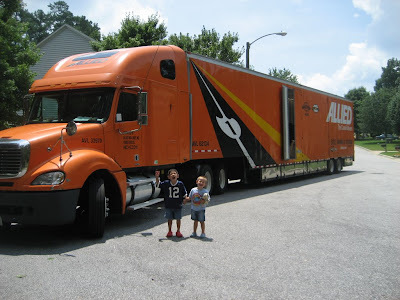 We aren't sure if we'll be contracting with the "Big Orange Truck" company again for this upcoming move. We'll probably know this week. They did a good enough job between NC and NE. In the meantime, I'm in "get 'er done" mode at the house, wrapping up some projects so I can start preparing for the move. This is stuff I can do while Dave's recovering at home. First off, finishing the boys' Halloween costumes, then finishing up my HAP crochet projects so I can put away my sewing/knitting/crochet supplies with my other craft supplies. Then, I can get started on the garden: I have to disassemble our compost bin and dig up Dave's hops. We plan to take rhizomes with us and get them in the ground as soon as we get to FL. I have to do it before Nebraska's first hard freeze. Timmy's Flower Pot -- Repurposed! iPhone and Potties Don't Mix!